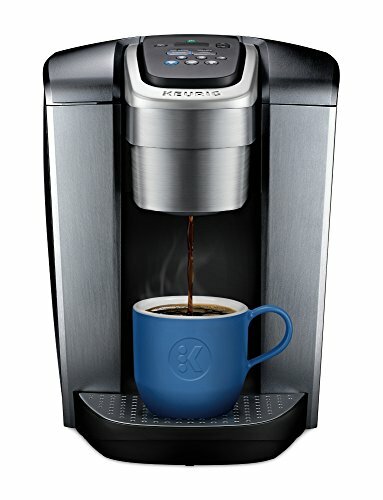 The newest Keurig single-serve Coffee maker, the Keurig K-Elite Coffee maker blends premium finish and programmable features together to deliver both modern design and the ultimate in beverage customization. With a striking brushed finish and metal details, it's a stylish addition to any kitchen. The Keurig K-Elite Coffee maker features a strong brew setting when you want to brew a bolder cup of Coffee, and an Iced setting to brew hot over ice for a refreshing, full-flavored Iced Coffee. It features five brew sizes, so you can brew 4, 6, 8, 10, or 12oz of your favorite Coffee, tea, hot cocoa, or Iced beverage in under a minute at the touch of a button. Choose from hundreds of delicious varieties of K-Cup pods, or brew your own ground Coffee using the universal My K-Cup reusable Coffee filter (sold separately). in addition to a host of programmable features like temperature control, the Keurig K-Elite Coffee maker provides hot water on demand for instant soups and oatmeal, and the large 75oz removable water filter let you brew 8 Cups between refills. REMOVABLE DRIP TRAY: Accommodates travel mugs up to 7.2” tall and holds a full accidental brew for easy cleanup.